Notes: Based on the manga by Yuiga Satoru. Kai Kudou is born as a new member of Ashurum, a group of ESPers (pronounced s-PERS). Their job is to hunt down those who have powers that cannot be matched by any mere human called "E's", or nouryokusha. 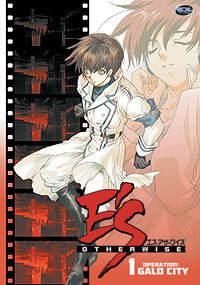 Kai becomes an ESPer because of a guarantee that her sister Hikaru will be cured of a severe disease. Kai is harassed by Shenlong, who takes any opportunity to test Kai's skills while her twin sister Shinlu enjoys his presence and makes sweets for him and the like. Soon, Kai begins to notice something. A year has passed very quickly, and they have been treating his sister Hikaru for quite some time, and she has yet to be cured. Shenlong reveals something to him. They don't need him. They are trying to figure out if he has the powers that Hikaru contains with herself. After hearing this, Kai goes on the run, and ends up with Asuka and her brother Yuki. He stays with the pair and goes do odd jobs with Asuka while fighting off problems caused by the struggle between Ashurum and other corporations looking to control the mobs and the city of Gald (which is where most of this takes place). After hearing numerous positive comments regarding the quality of E's Otherwise from a friend of mine, I decided to make it a point to see a showing of E's at Otakon. I was a bit let down by the quality of this anime. Granted, it isn't awful, but I expected far better after the first few episodes. While the premise is somewhat interesting, the execution is lacking so far throughout the anime. Not too much in terms of personalities have evolved. The focus on Kai and Hikaru is probably the best-explained portion during the first four episodes, and was very intriguing. The struggle for power over a city that has been completely destroyed is a bit ridiculous. Ashurum: I want this piece of rubble!! Other Corporation: No it's mine!! Mine! Mine! Mine! I seriously hope that this is explained better because if this is not done, then the anime will be very funny for all the wrong reasons. Heck maybe the man vs. machine conflict that occurs episode four could be a sign of decent things to come. This is an anime that cannot stand on just one plot element alone. Every element that exists in this anime must be merged in one way or another for this plot to work. The artwork and animation are about average, maybe a bit above average. The character designs in general are pretty good, with plenty of gloss where necessary along with a very clean and smooth look. The animation could use some improvement, but it really isn't enough to be a severe detraction for this series. The opening and ending themes truly shine though. The opening theme contains blasting rock music (the speakers at Otakon were so loud that the audience was covering their ears) and while it doesn't catch onto you right away (similar to the music in FLCL) it does become stuck in your head. On top of that, you can't find it anywhere online!! The ending isn't as good as the opening, but holds its own. So far, it looks to be worth about a viewing, but there's much better out there to see. Take a look at that stuff before watching E's. Recommended Audience: Some chunks of violence. In general, teens and up would be okay.